When The Future Laureates first released their debut full-length, Your Mom Would Like Us, it was easy to write it off as silly pop music in the vein of Presidents Of The United States Of America. Over the years since then, they’ve matured as songwriters and as a band. They still write a lot of fun music, but they dig a little deeper and add more complexity to their tunes. They remain one hundred percent a pop band, but they’d be more in line with a Matchbox Twenty-type band (love em or hate em, Rob Thomas writes damn fine pop songs). They stake their claim right out of the gate on “Galahad’s Song.” It kicks off with a piano chord progression that reminds me of a Lionel Richie song, but then Matt Daigler’s voice comes in. Before you know it there are harmonies, horns, guitar solos, and then a trippy breakdown. The song is about how life is a journey and you have to be ready for anything. The final line of the song is “Come on let’s go,” as if the band is inviting us to travel along with them. The songwriting process on Fortress Sessions was different than it had been in the past. Danny Surico wrote all but one song on the album (bassist James Hyde wrote the very strong “Carry Me Away”), and I think that having that constant voice behind the lyrics helps the album flow better. Another smart choice is having Daigler take over all lead vocals instead of switching off. Not that Danny has a bad voice-it’s quite good actually-but the stability of one voice helps solidify the foundation of the album. I couldn’t find a bad song in the bunch here. There are a couple I like more than the others, of course, but that’s all just personal taste. I was highly interested to see how the studio version of “Lovely” would turn out. When we had them over at Handwritten, I thought it was a brilliantly realized song. There are a lot more layers on Fortress Sessions version, which I feel take away from the vocals. I’m biased, though. I really like “Song For My Grandchild.” It starts off like a regular folk song and then goes crazy after the chorus. There’s some really strong guitar work going on here-one of those songs I’ll spend hours perfecting the air guitar pose to-and they jam a lot of fun into a song under two and a half minutes. It reminds me a bit of “Fight Test” by The Flaming Lips. It doesn’t sound anything like it, but I feel like the storylines about standing up for yourself are similar. “And while you drive the blinding signs remind you that hell is real. At the broken souls who don’t mean that much to ya. As we learned in our interview last month, The Future Laureates have no interest in being “cool.” That freedom from concern for what others think allows them to make songs that are true to the music they love. 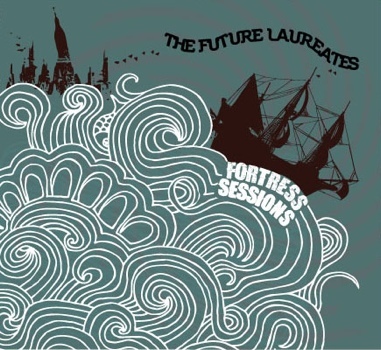 Fortress Sessions is a record that holds up a mirror to the groups personalities. It’s fun, it’s ambitious, and it’s sweet. It might be the first summer record of the year in Chicago. On the album’s final track, “Lines,” Danny writes “I know you’re an overachiever could you ever set your sights on me?” Maybe it’s time we all set our sights on The Future Laureates. Pingback: 60 Minutes Or Less: The Hasty Revelations Album « Music. Defined. Pingback: Chicago Roots Collective 4th Annual Showcase « Music. Defined.